The NodeMCU version of the board has an on-board 3.3v voltage regulator and can be powered from the USB port (5V), or through the vin pin (5-7.5v recommended). All GPIO pins work at 3.3v and the board may be damaged, when connected directly to 5v Arduino compatible modules. Additionally, the maximum current that can be sourced from a digital pin is 12 mA. Use a high value resistor for LEDs (1k Ohm) and do not connect servos, motors, or other peripherals that draw large current. 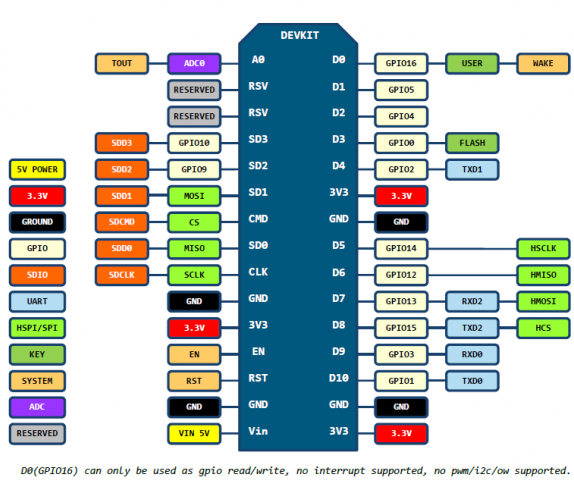 As mentioned in the previous post, if you are using one of the more popular NodeMCU board variants you can refer to the pin mappings below. In the Arduino sketch, you can refer to the ESP8266 pin by their GPIO number (for example, if you have a LED on GPIO16: int ledPin = 16;), or by the pin printed to on the NodeMCU board (example: int ledPin = D0;). 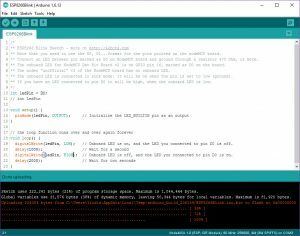 Once you load your Arduino sketch on the ESP8266 you are essentially overwriting the default AT firmware on the ESP8266. 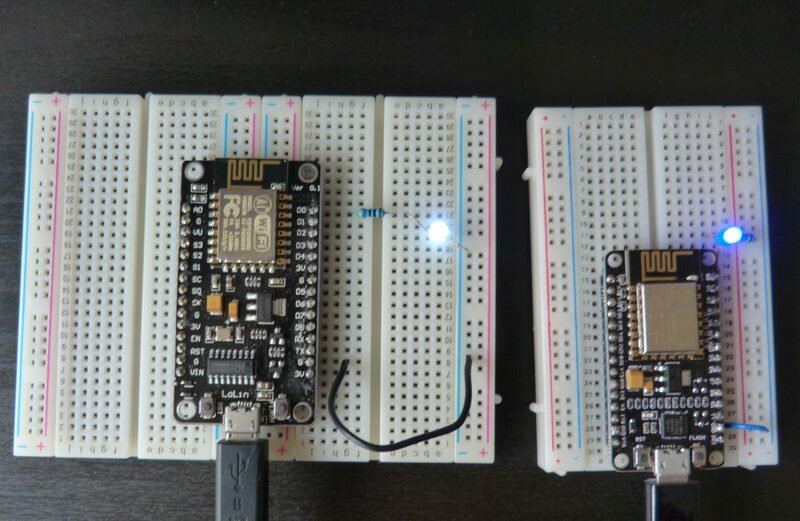 There are two parts to the program that you are loading: your compiled sketch and the ESP8266 binary firmware to support the low-level API calls to the ESP8266. You can easily restore the original firmware on the ESP8266 MCU using one of the firmware flashing tools available. The Arduino ESP8266 board definition library available via the Arduino Boards Manager manager is based on the Espressif NonOs SDK. 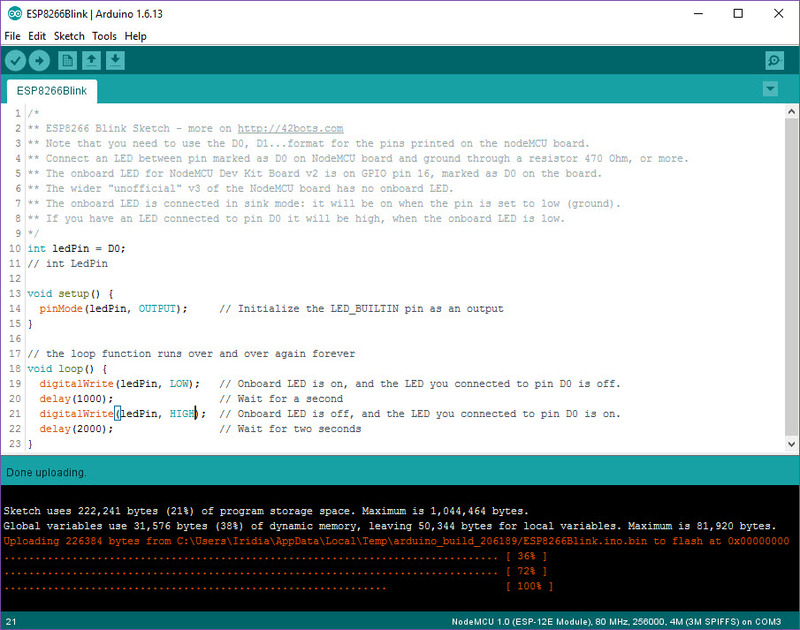 Version 2.3.0 (the latest available through the Arduino IDE Boards Manager) is based on nonOS SDK 1.5. There is an nightly build version of the board definition based on the latest version 2.0 of the NonOS SDK. The most often asked for features in v2.0 of the nonOS SDK are related to security: support of TLS 1.2 (required by some cloud based services, like Watson IoT) and WPA2. Non of these are needed for our basic sketch below, though and I am using the ESP8266 Board library version 2.3.0 below. ** to pin D0 it will be high, when the onboard LED is low. digitalWrite(ledPin, LOW); // Onboard LED is on, and the LED connected to pin D0 is off. digitalWrite(ledPin, HIGH);// Onboard LED is off, and the LED connected to pin D0 is on. Connect the NodeMCU board to a USB port on your computer, make sure the correct board is selected and upload the sketch. You should see the LED blink and your Arduino IDE ESP8266 programming environment is now fully set-up and tested!